Apple's upcoming iPhone 5S and iPhone 5C already look like one of the worst kept secrets in the tech industry. After appearing in leaked images, countless number of times, both smartphones are all set for an official unveiling on September 10. 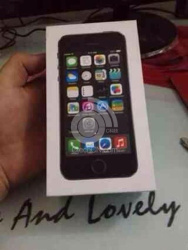 We recently saw the images of the Apple iPhone 5C packaging and now, we have the leaked images of the retail packaging on the iPhone 5S. It looks like the Apple iPhone 5S might come with a different packaging cover than the one we have with the iPhone 5. Somebody has also noticed there is a circle around the home button and if this indicates something, then the previous leaks would point us towards a finger print scanner option. Also, the user interface of the iPhone 5S on the retail pack looks a bit different and it could as well be the iOS 7, which is expected to start seeding soon. 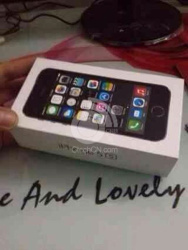 However, since the images are bit blurry, we are not quite sure if this is the real deal, it might as well be faked. Anyways, the wait is almost over, as Apple's event is just 4 days away. Do remember to check back with us as we will be bringing you all the latest news from Cupertino. Thanks Arjan, for sending this in!